Apparently, a lot of people are convinced that NASA's Mars missions are a big hoax, and that the space agency's rovers are actually sending back photos from an island in Canada. Obviously NASA says this is complete nonsense. "NASA has rovers on Mars," Laurie Cantillo, a spokesperson for the space agency, told BuzzFeed News. 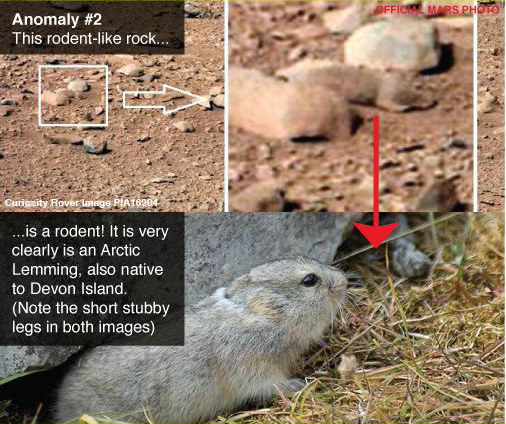 The conspiracy theory has been making the rounds for at least two years, with YouTube videos and blog posts on fringe websites arguing that NASA is faking the images on Devon Island. Devon Island is the largest uninhabited island on Earth, located in the Arctic circle in Canada's far north. NASA uses a crater on the island to simulate Mars-like conditions, and it's where the space agency has run field tests for its rovers. Mars trutherism has had a resurgence recently, with the claim about Devon Island recirculating on Reddit and several websites that peddle conspiracy theories. The websites saw tens of thousands of Facebook shares, comments, and reactions to their posts, according to an analysis using BuzzSumo, a social analytics tool. A Reddit thread on r/conspiracy, meanwhile, saw over 200 comments. "This is kind of mind boggling considering I actually believed they sent a rover," wrote one Reddit user. "If they are just on this island though, where is NASA's money actually going to? The rabbit trail begins." Then there are all the people who yell at the Twitter account for the Curiosity rover, calling it fake news. One piece of "evidence" offered to support the theory is that some objects in photos sent back from the Curiosity rover on Mars resemble things on Earth. 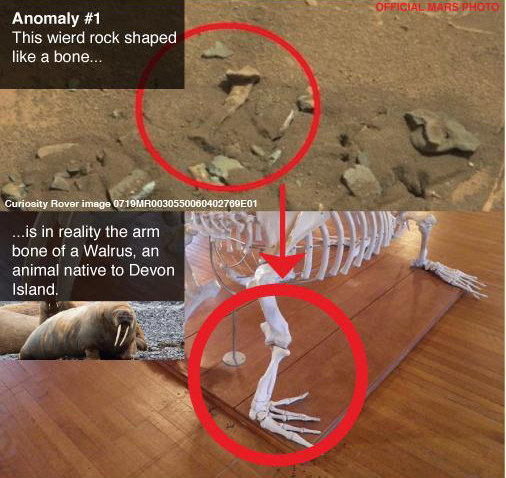 An unusually shaped rock is actually "the arm bone of a walrus," according to a widely circulated image, and another rock is actually "an Arctic lemming." People also claim they've found faces and human figures in photos from Mars. In these cases, what people are actually experiencing is pareidolia. That's the psychological phenomenon of finding familiar patterns where none exist. It may have helped our ancient ancestors navigate a dangerous world filled with predators, but today this evolutionary quirk is just as likely to trick us into seeing things that are not really there. Of course, there's plenty of evidence that NASA actually sent rovers to Mars, including a lot of stunning photos like this one. There are currently two active vehicles on the planet's surface, the exploration rover Opportunity and the larger science lab rover Curiosity. NASA lost contact with the Spirit in 2010, after it became trapped in sand. Here's a look at Curiosity on the surface of the planet, as seen in a recent image from the Mars Reconnaissance Orbiter. That tiny blue dot in the middle is our pal Curiosity. “The best way to fight fake news is with truth," NASA's Cantillo said. "We work hard every day to share the exciting news of our missions and science with everyone."